Fred & Friends, a designer of distinctive gifts and house wares, attracts quite a bit of attention from retailers and distributors all around the world. The company receives hundreds of inquiries each month, many of which are from potential overseas clients. Fred & Friends needed to make information readily available to these clients and be able to easily update and maintain this data. However, they did not want this sensitive information to be accessible to the general public, so they also needed a way to limit access to registered users. Fred Roses, the company's founder and CEO, knew that a wiki would best serve the company's needs, but he was having trouble finding the right wiki service provider. For a company that develops and sells fun, trendy products, the visual aspect of their website and all other supplemental information must have a sophisticated design in order to uphold their image — as is evident in the Fred & Friends primary website. However, as Fred Roses was reviewing his wiki options, he noted that many of the wiki platforms had a raw, unfinished look. Presenting information in this way to his potential clients simply would not do. Roses found that EditMe's wiki packages had excellent formatting options and did not require coding. "I was up and running with EditMe in minutes, and I completed our new Global Business Partner Portal (including writing a LOT of text) in one day. I found the interface straightforward and consistent, and the online help tools very organized and useful," says Fred. As a matter of fact, Fred discovered a tip from EditMe's help pages that led him to Wufoo.com, a website that enables users to design web forms, to create and integrate three useful forms for the Fried & Friends global business partner portal. 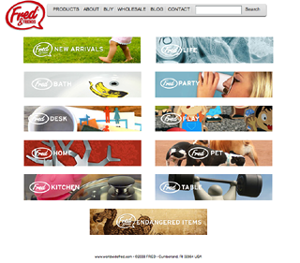 As potential clients approach Fried & Friends, they are granted access to the company's Global Business Partner Portal, which can help them decide whether they would like to sell or distribute Fred & Friends products. Because of the company's popularity, they needed to grant access to hundreds of current clients, who would use the Global Business Partner Portal as an on going resource, and to hundreds of potential clients, but most wiki packages charge steep license fees per user. With that type of pricing structure, a wiki package would not have been cost-effective. EditMe offers unlimited registration of new users — all for a reasonable monthly price, making EditMe the ideal match for Fred & Friends' wiki needs. "It's great to find mature, stable tools out there that benefit my business and can be put to use without any fuss. Incorporating this wiki into business procedures is saving us time without wasting money." Create a centralized, informational wiki to educate clients and potential clients about the company's international policies and procedures. Match the polished, sophisticated design of the company's general website to further attract potential clients. Protect the company's sensitive information from the general Internet user while allowing a large volume of registered users to access the wiki. EditMe's wiki package enabled the company to create a comprehensive informational wiki within just one day, and the team can now update and maintain that information easily. EditMe's page designs have a finished, visually pleasing look, consistent with the company's established aesthetic. EditMe offers unlimited registration for wiki users, so the company can continue to add as many users as they wish with no rise in price.